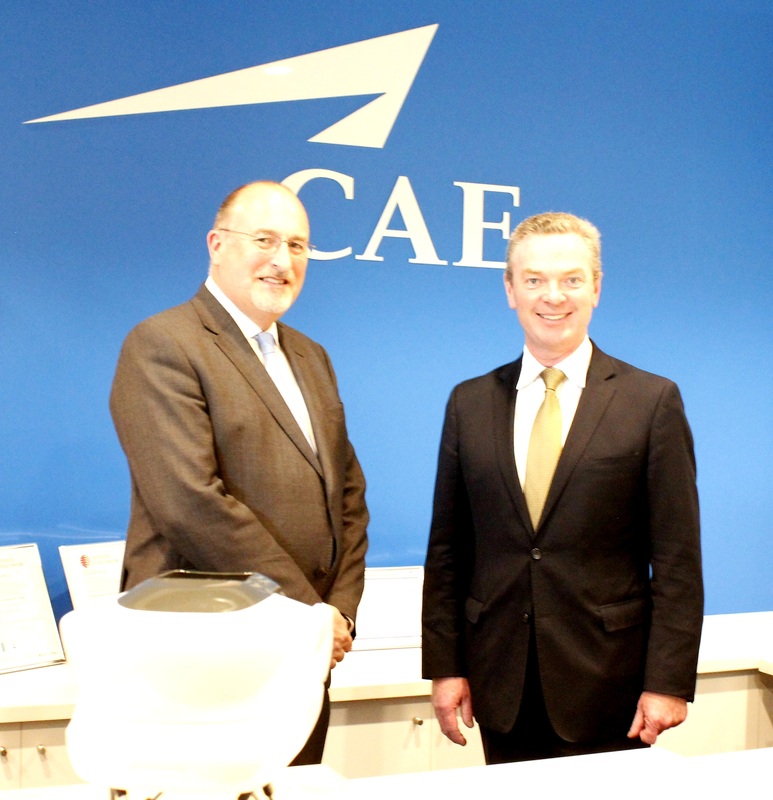 Australia's Minister for Defence Industry the Hon Christopher Pyne (left) congratulates Ian Bell, CAE's Vice President & General Manager, Asia-Pacific/Middle East, on the opening of CAE's new office in Canberra. Ian Bell (left), CAE's Vice President & General Manager, Asia-Pacific/Middle East was joined by the Hon Christopher Pyne (right), Australia's Minister for Defence Industry, at the opening of CAE's new office in Australia's capital of Canberra. 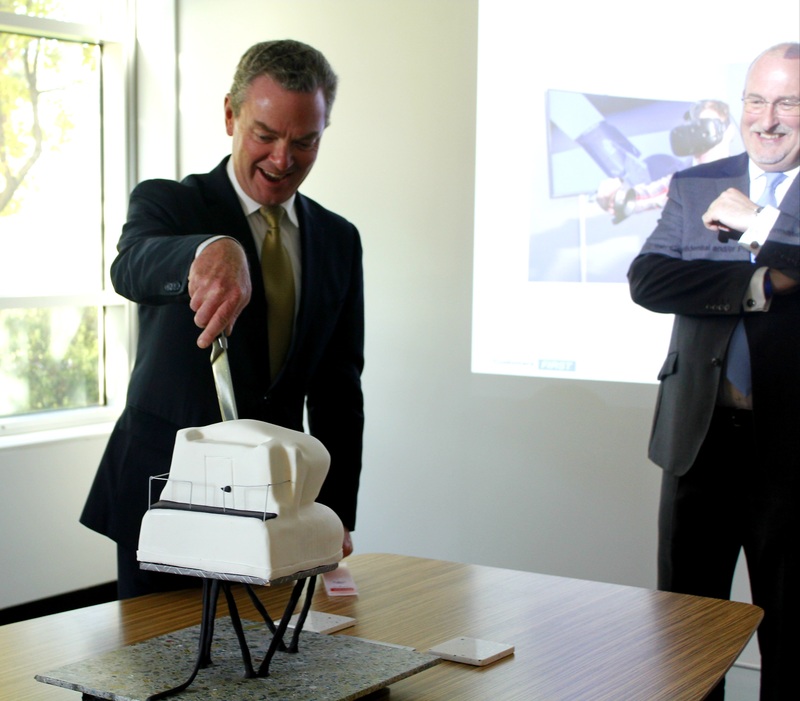 Australia's Minister for Defence Industry, the Hon Christopher Pyne, cuts the simulator cake to celebrate the opening of CAE's new office in Australia's capital of Canberra. CAE today announced that its Defence and Security business unit has expanded operations in Australia by opening a new office in Canberra, the capital city of Australia. 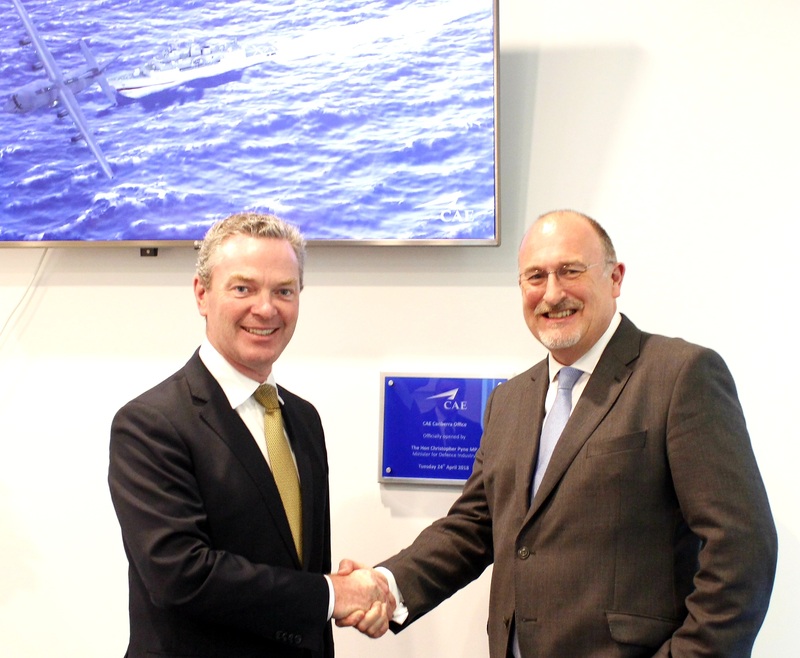 The new office was inaugurated yesterday during a visit from the Honourable Christopher Pyne, Minister for Defence Industry, and Ian Bell, CAE’s Vice President and General Manager, Asia-Pacific/Middle East. The new CAE office is located in Brindabella Park. CAE’s new office in Canberra adds to the company’s already significant presence in Australia. Across CAE’s defence, civil aviation, and healthcare business units, the company employs approximately 300 people at almost 20 sites across Australia. CAE also took the opportunity during the inauguration of its new Canberra office to demonstrate some of the company’s world-class simulation technologies and capabilities. CAE demonstrated a virtual reality (VR) solution of a ground control station (GCS) for remotely piloted aircraft (RPA). This immersive, cost-effective VR training solution can be used for familiarization and procedural training for maintainers and aircrew, thus freeing high-value RPA ground control stations for more advanced training and operational use. The virtual GCS provides a walk-through of a ground control station with the ability to highlight major components and functions. CAE Australia is part of the General Atomics-led Team Reaper Australia pursuing the Project Air 7003 requirement for the Australian Defence Force. CAE Australia Pty Ltd was established by CAE in 1994 and is headquartered in Sydney. CAE is the largest provider of aerospace simulators and support to the Australian Defence Force (ADF) and provides a range of training services on platforms such as the KC-30A, C-130J, MH-60R, MRH90, Hawk Mk127 and others. CAE is the prime contractor on the Maintenance and Support of ADF Aerospace Simulators (MSAAS) contract as well as the Aerospace Simulation Through Life Support (ASTLS) contract.